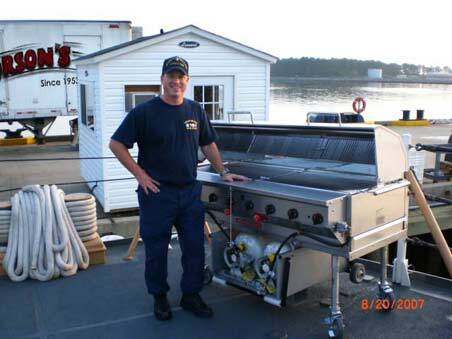 Indoor Charbroilers › | Indoor Griddles › Dvorson's is Celebrating Our 66th Year! Offering Everything for the Kitchen, except the Food! 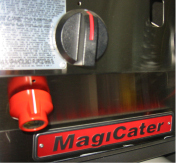 Crafted in the United States -- MagiCater by Magikitch'n sets the standard with the highest quality grills and char-broilers in the industry! Free Shipping & Lowest Price Guaranteed on All Grills (and accessories with grill purchase) to commercial destinations in the contiguous United States. We have Great Shipping Rates for Alaska, Hawaii and beyond too. 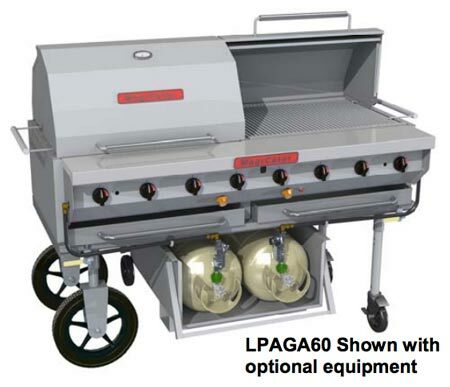 heavy duty chrome cooking grids, steel legs with casters, complete gas system, 40 lb horizontal tank(s)** in removable tank cart with wheels. 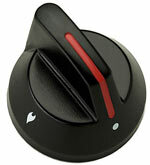 Includes spark igniter system (piezo ignition) with "SS" models. 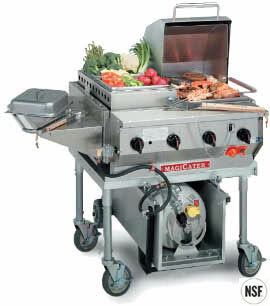 All grill models from MagiCater are NSF certified. Note: "SS" Model Series are completely Stainless Steel Construction, recommended for seaside resorts and similar environments. 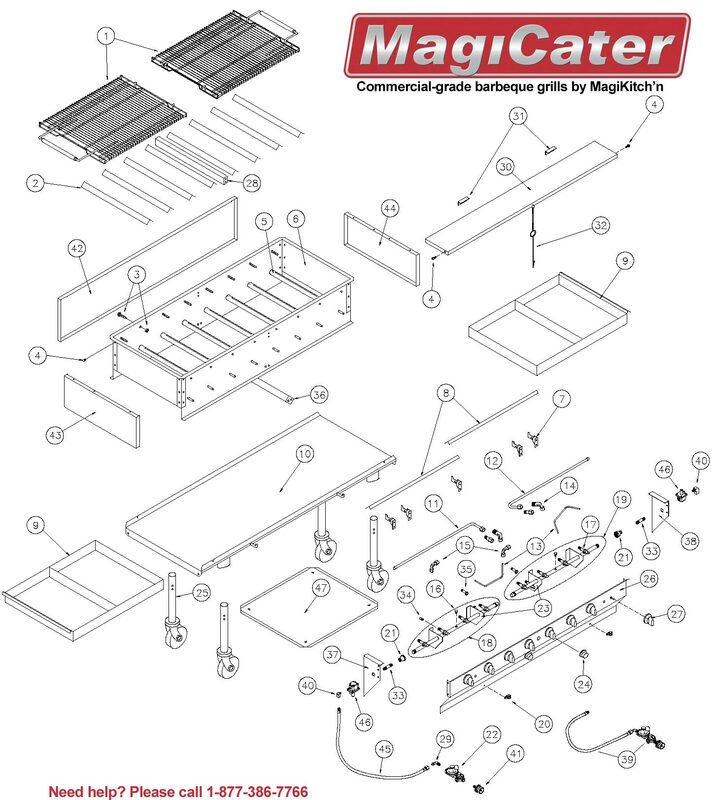 Free Shipping on all MagiCater Grills! Note on Stainless Steel (SS) Units: All Stainless Steel includes - Leg tubes, water tub, inner frame wall are made from stainless steel instead of the standard aluminized steel. 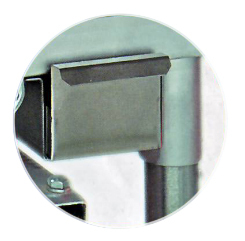 The MCSS series has full stainless steel construction, recommended for seaside resorts and similar environments. Available in 30" and 60" widths. 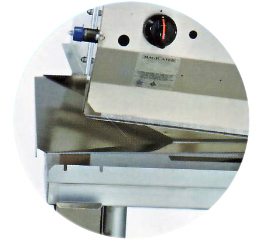 Stainless steel construction, stainless steel front, sides, back and service shelf. Modular design for easy transport. Stainless steel radiants, pilot system and water tubs. 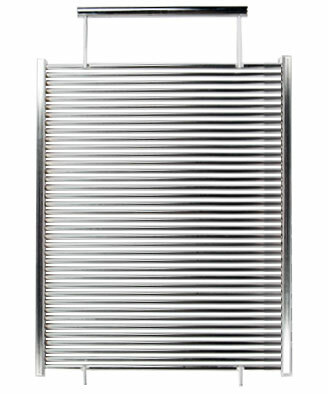 Heavy Duty Steel cooking grids come as standard equipment on this model (large diameter cold-rolled steel). Steel legs with casters. Complete gas system including 20 lb vertical tank(s)** with side tank holders. 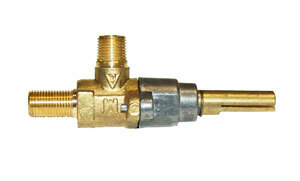 Includes spark igniter system (piezo ignition). NSF Certified. 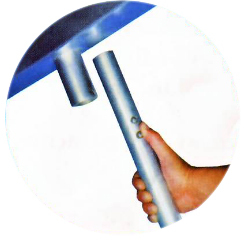 Note on Stainless Steel(SS) Units: All Stainless Steel includes - Leg tubes, water tub, inner frame wall are made from stainless steel instead of the standard aluminized steel. 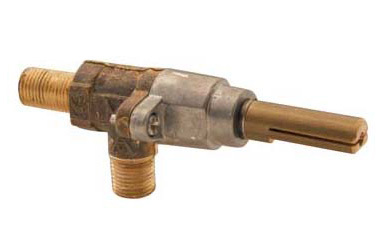 Spark Ignition included with "SS" models. Available in 30” and 60” widths. Includes aluminized steel construction, stainless steel front and service shelf, modular design, stainless steel radiant's, pilot system, water tubs, Steel cooking grids, steel legs with casters, dual tank hookup (tanks not included). CE approved unit available. NSF certified. 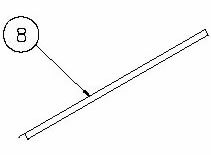 SS Models include spark igniter system (piezo ignition). 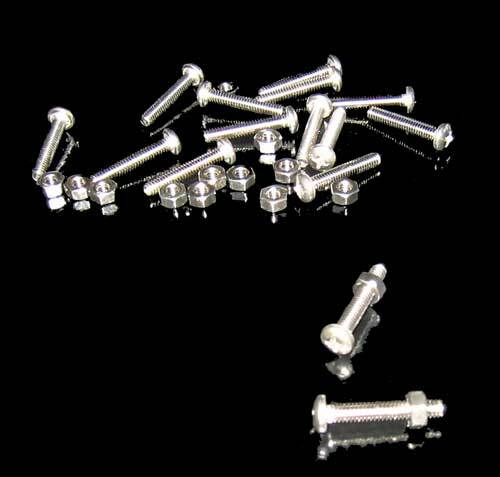 SS Models are completely Stainless Steel Construction. Available in 30” and 60” widths. 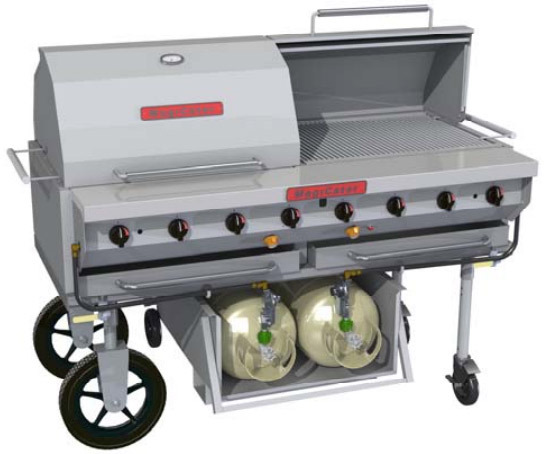 Includes aluminized steel construction, stainless steel front and service shelf, modular design, stainless steel radiant's, pilot system, water tubs, chrome cooking grid, steel legs with casters, 3/4” gas inlet at the left front side of unit with regulator. 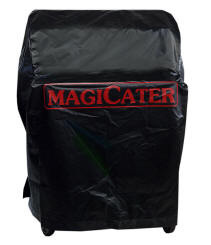 For that unique BBQ flavor, MagiCater offers two grills that cook with charcoal or mesquite chips. The CG60 and CGL 60. 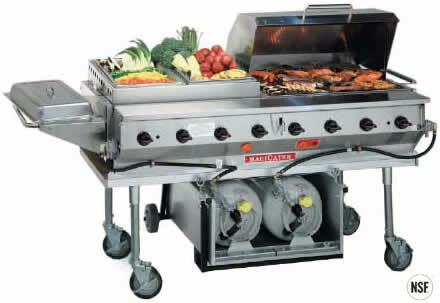 MagiCater's Snap in legs and easy set up allows these high performance grills to go where other grills are left behind. The CGL-60 is designed to be light in weight so it is easy to transport. While the CG-60 features the heavier chrome top grid, charcoal screens, module design and a one-person adjustable top grid. Which ever grill you choose, MagiCater charcoal grills are easy to use and designed for great cooking performance wherever you are catering with the CG-60. 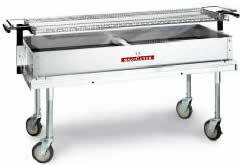 Standard unit includes aluminized steel construction, adjustable chrome cooking grid, steel legs with 6" casters. 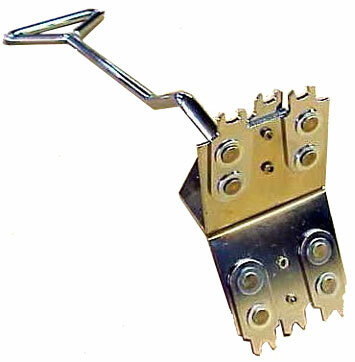 Snap-in leg system. Recommended one layer of coal. 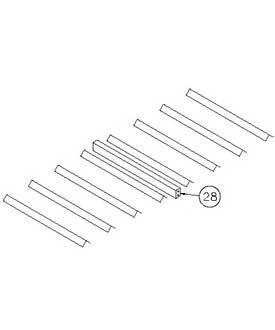 Please note: Two 15" Hoods on a 30" MagiCater Grill requires a split grid configuration. 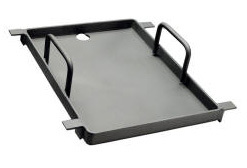 1 Set Includes 4" deep full steam pan, 2" deep full steam pan, 2" deep perforated pan, full pan cover. 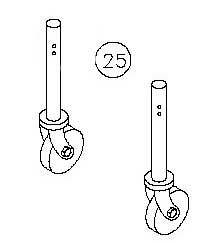 Two large 14" wheels on one side instead of stationary casters, shown in image at left. Custom made scraper to fit the shape of the top grids on MagiCater Outdoor, or Magikitch'n indoor grills. 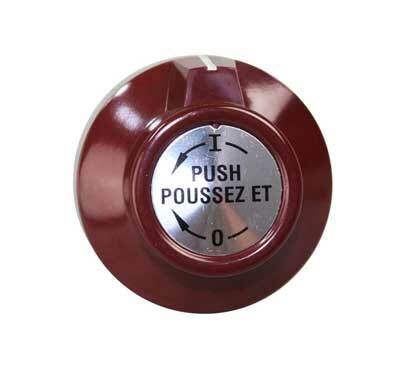 Choose for use on Round or Scround top grid when ordering. 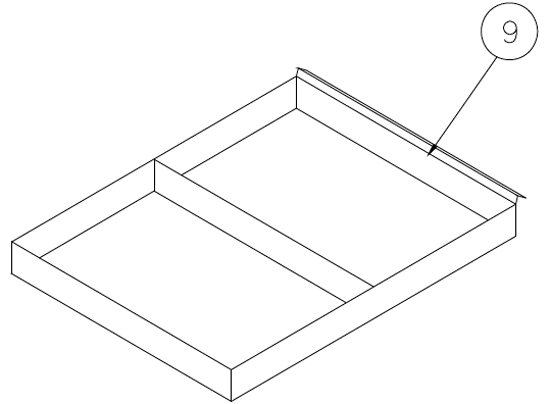 NOTE: Above item requires split grid config. Orders may be placed by phone (1-877-386-7766 or 415-332-5840), online shopping cart, or secure order form. 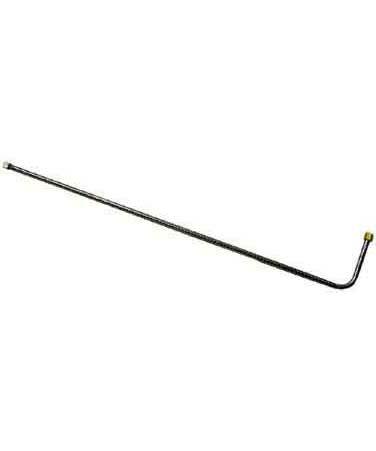 Top Grid, for 30" section, Standard Duty, 3/16" thick diameter Steel bars on grid. 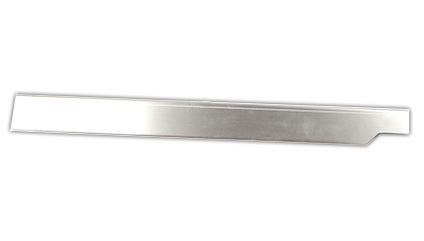 Top Grid, for 30" section, Heavy Duty, Chrome Stainless Steel, 3/8" thick diameter bars on grid. 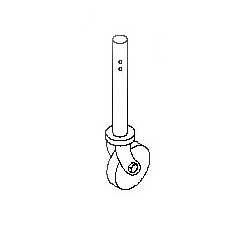 Runner Tube for Burner, Left Hand. 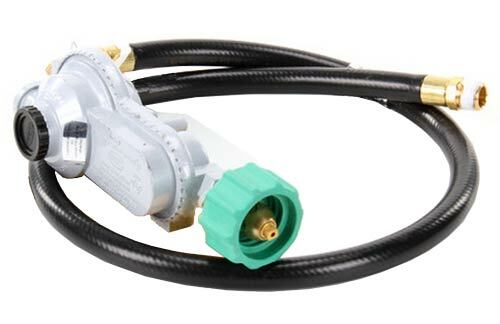 For LPG/AGA, etc. Runner Tube for Burner, Right Hand. For LPG/AGA, etc. 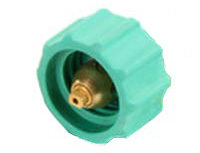 DVMK-22 Two-Stage Regulator. located on hose, at propane tank. 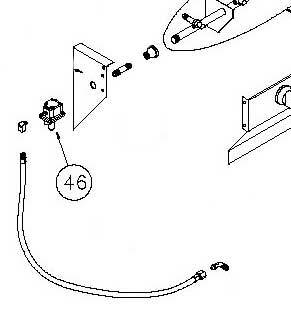 Leg Assembly, with Casters (set of four). Come by when you are in town, we'd love to see you!